Here's my codfish project as it looked yesterday. (Alternate title: Codfish with Drawing Board). I am decorating this wooden codfish for the Marblehead Arts Fest. The same wooden fish cut-out was furnished to 50 area artists to decorate. All the decorated codfish will be displayed in Marblehead and then auctioned off. My fish is going to be silver with markings in hot pink and dark blue, with painted gold accents to suggest scales. I am working with tissue paper and acrylic gel medium. I am still working on the first and most tedious step, covering the fish with a base of silver tissue paper, pieced together to suggest the form of the fish (body, fins, tail). You can't tell by the photo, but I am also applying tissue paper to the sides of the form. This is part of my prep work for a wooden codfish that I am decorating for the Marblehead Arts Festival. (There will be fifty of these wooden codfish, each decorated by a local artist. The codfish will be on display in Marblehead and auctioned off this summer.) I am using tissue paper to create a silver codfish with pink and blue markings. I also want to suggest scales with gold accents, but have been struggling with how to do it. I tried painting through a net, but the method was unreliable. I even had the idea of painting the net itself and pasting pieces of it into the surface. But I thought it was a bit too literal, and besides, the net was casting a bit of shadow on the surface. 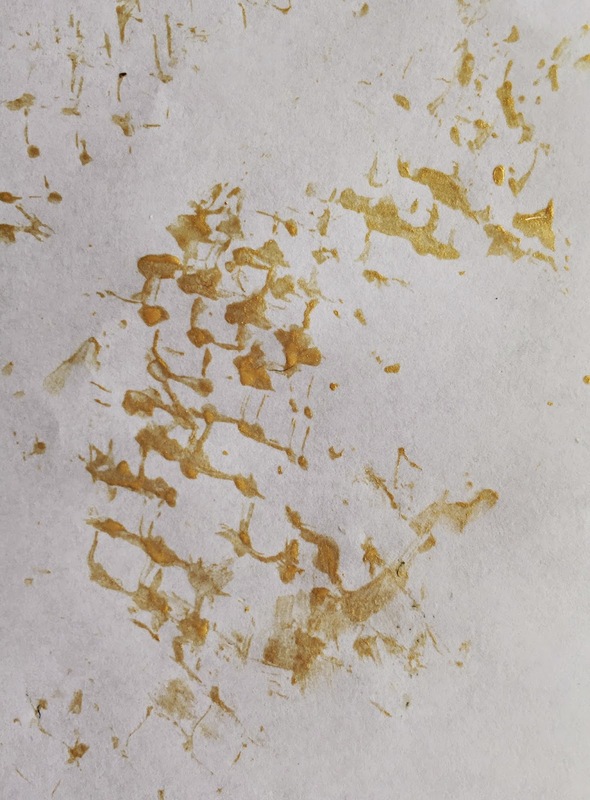 So the other day, I gave it another try, on a piece of computer paper and came up with a method that works: dipping the net in the paint, pressing it in place, and rolling over the net with the handle of a brush. Here is my trial run and this is how it looks. I was asked to decorate this wooden codfish and donate it to the Marblehead Art Fest. Fifty local artists are doing this. The decorated codfish will be on display in Marblehead and then auctioned off in July. This is how my codfish looked on April 25, 2015. It is about a yard long and hard to photograph, so I put it on the sofa. I thought about calling this "Cod on the Couch" and I think it would be fun to photograph this thing in different places. Anyway, I am covering the wooden form with strips of silver tissue paper. You can see that it catches the light. I plan to decorate it with bright pink and dark blue markings made of tissue paper, with gold accents to suggest scales. 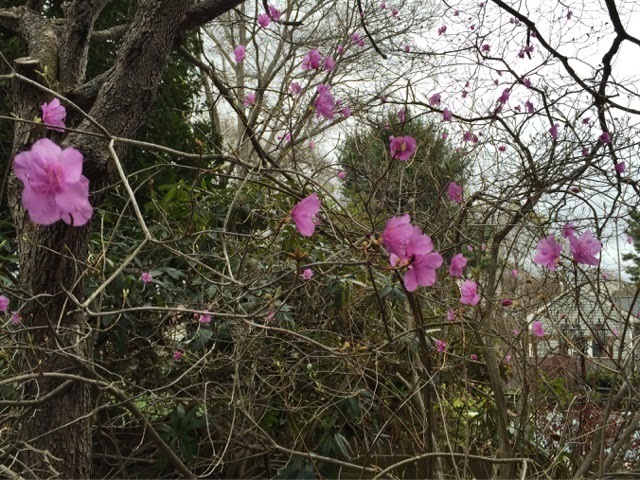 We are having a string of cold spring days, but the Korean rhododendron in my yard is blooming anyway. Here is a picture I took of it. This is the wooden codfish that I am decorating for the Marblehead Arts Festival as it looked on Friday. Although there were still decisions left to make about the details project, I was ready to get started. I drew in lines for the body of the fish, and then started cutting and pasting strips of silver tissue paper. This doesn't look like much yet (or if anything, it looks like duct tape! ), but the silver paper does reflects the light. And I know from my trial runs that the markings in bright colors and the gold accents will make a difference. This is a continuation of my prep work for my codfish project. (Along with 49 other local artists, I am decorating a wooden fish to donate to the Marblehead Art Fest.) 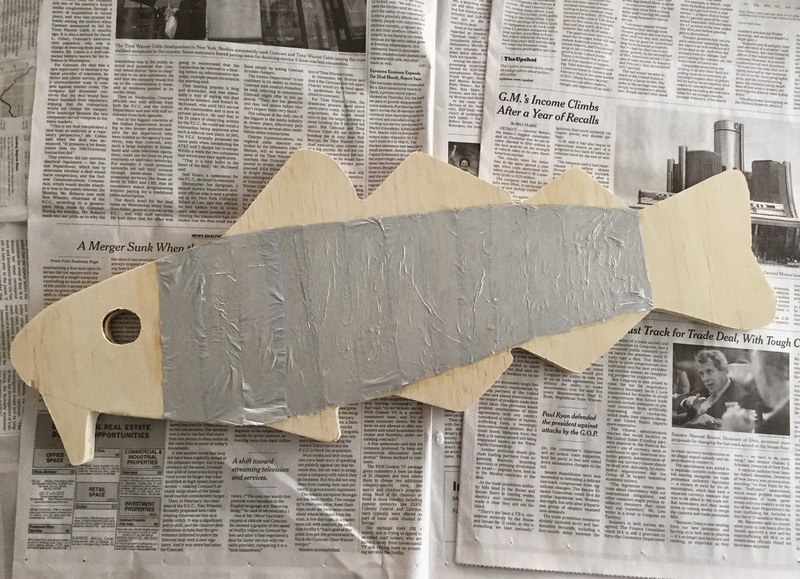 I am trying out my ideas on scrap lumber before working on the actual wooden fish cutout. I have been trying to create the illusion of scales by painting through a net with gold paint. But the result wasn't as reliable as it needed to be. After a number of tries, the net itself had been painted gold. That gave me the idea of actually using gold painted netting as an element of the collage. This is a trial run to see how that would look. To be continued. . . . This is more prep work for my codfish project. 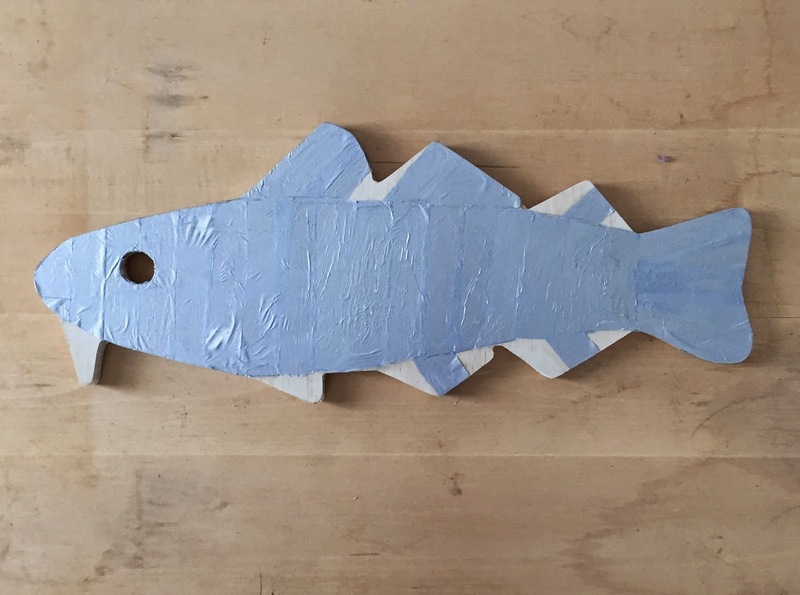 Fifty local artists are decorating wooden codfish to be displayed in Marblehead and then auctioned for the Marblehead Arts Fest this summer. Rather than risk having to do "overs" on my big wooden codfish, I decided to do some trial runs on small pieces of scrap lumber. For my first woodblock trial, I tried out six different ways to do the markings on the fish. I chose one of them and in this trial run, I am trying to see how my choice is going to look. 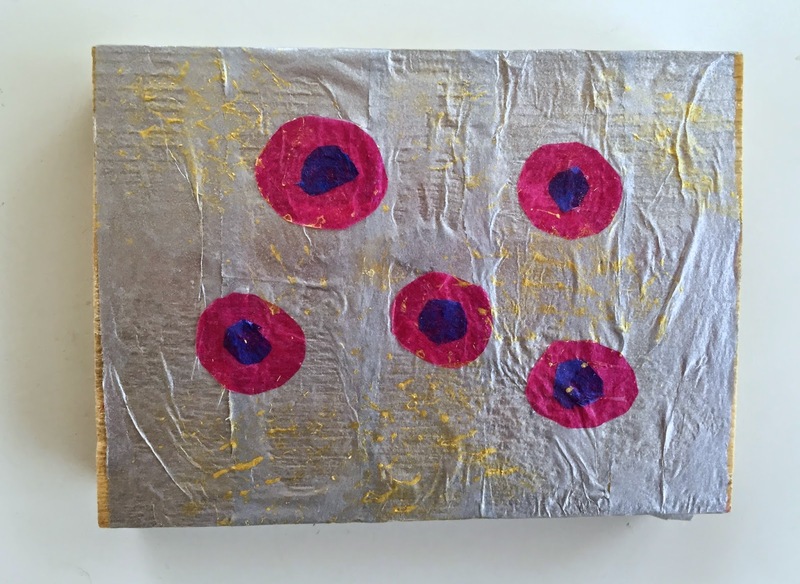 What you see here is silver tissue paper collaged to the woodblock, with markings also made of tissue paper. I also tried adding gold acrylic accents, painted through a net to look like scales. So far, I haven't been able to get that to work the way I would like, at least not consistently. And that could be a problem, because that would be the final step in the process. But I still like the touches of gold paint because help to suggest the iridescence of the skin. To be continued. . . I am going to decorate a big wooden codfish to donate to the Marblehead Arts Festival. Fifty local artists are doing this, and the decorated fish will be displayed in Marblehead before they are auctioned off. I picked up the wooden fish last week, and have been thinking hard about codfish. After looking at photos of codfish, I decided to do a very loose rendition of the markings on the codfish, but it bright colors. 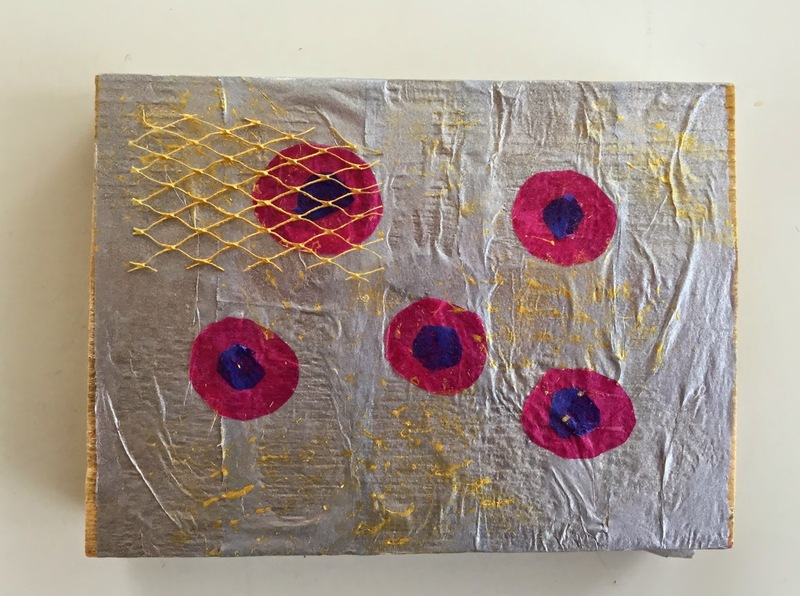 I decided to do this with collage, using layers of tissue paper and gel medium. And I knew I wanted to used silver paper for the background, with bright pink and dark blue. I decided to try out my ideas on a piece of scrap lumber. (This wasn't going to be like working on a piece of paper. "Can I have another fish, please?" wouldn't be an option.) So I did six different trials on my block of wood, with different sizes and proportions and positions of pink and blue. I also decided to try adding gold accents, painted through a net to suggest scales. It was hard to get the result I wanted, but sometimes it worked. Anyway, this was a helpful exercise. After spending a little time looking at these six trial runs, I had a clearer idea of what to do. To be continued. . . This is a wooden codfish that I am going to decorate for the Marblehead Festival of Arts 50th Anniversary Celebration. 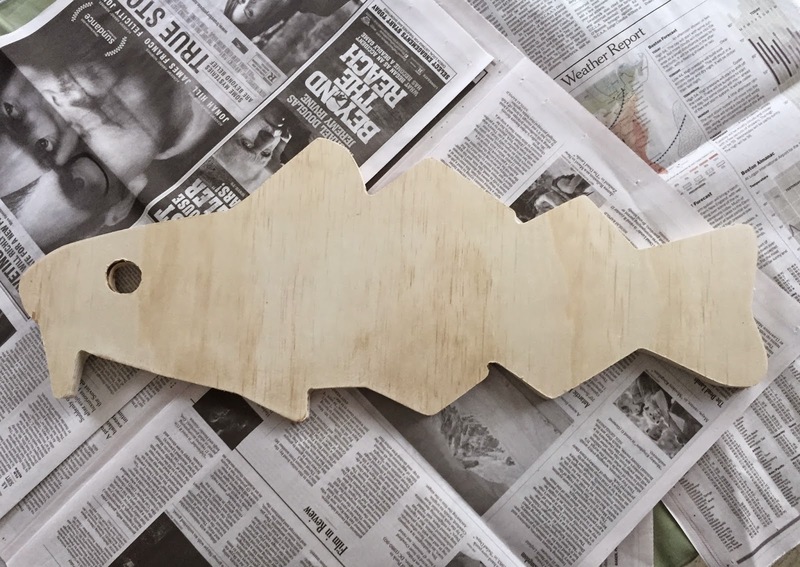 I am among fifty local artists who are going to decorate one of these wooden fish, which will then be displayed in Marblehead, MA, and auctioned off. Last week I drove over to Marblehead to pick up my wooden codfish. It was wrapped in plastic when I picked it up. As I was unwrapping it back home, I remembered that as a kid, I was used to seeing fresh fish wrapped in newspaper. So before I started decorating this fish, I decided to kick off this project by taking a photo of my wooden fish against a backdrop of newspapers. It's been a long winter, here north of Boston. But most of the snow is gone, and displays of flowers are beginning to appear outdoors at plant stores and in front of supermarkets. 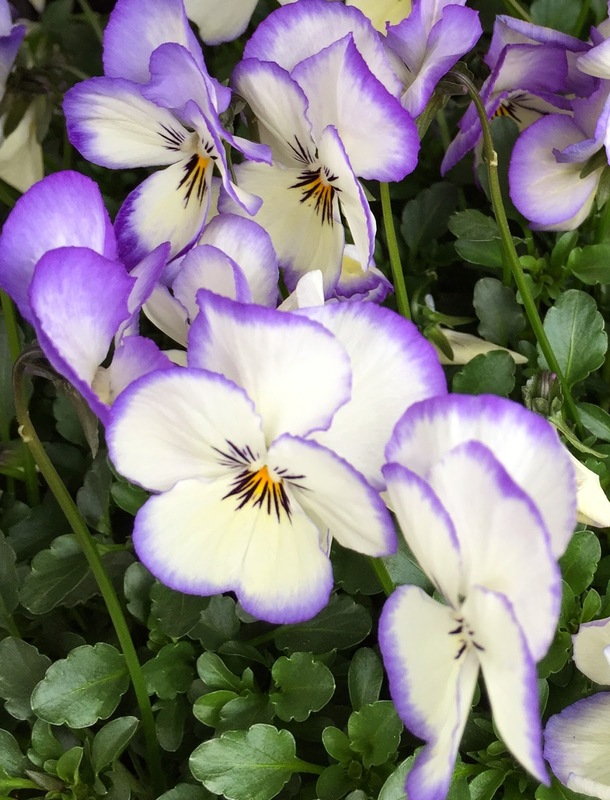 I took this photo of some violas on a recent trip to a plant store. Tonight I cropped this image of the one of the best photos. I love violas; they seem to turn up just when I have given up any hope of warm weather. They make me smile. And though they might not look like it, they are actually very sturdy. I made this over the weekend while I was working on another project (my decoupage box). 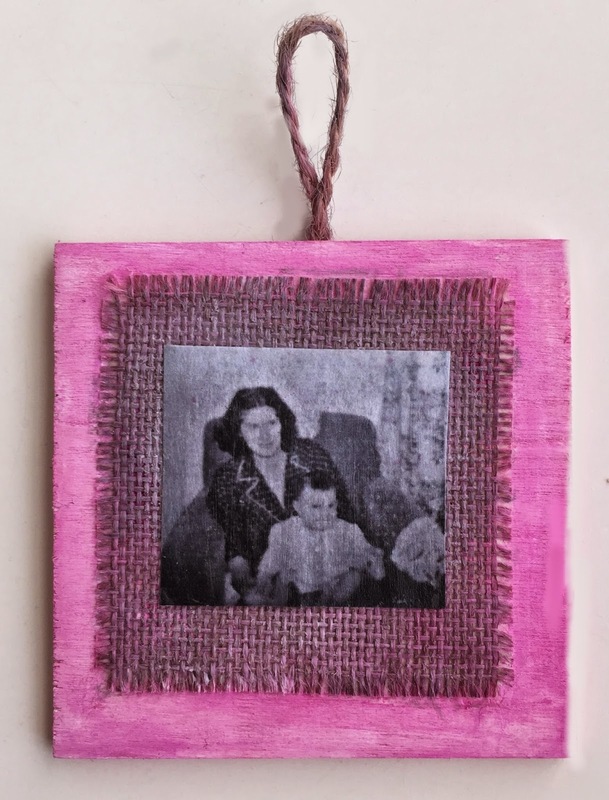 This is a black and white photographic image on a pink plaque with jute. This is only about three inches square, designed to be a Christmas ornament, but it can also be hung on the wall. (With a lot of them, you can make a family tree.) I painted the wood a soft pink, and wanted the jute to be gray with a pink cast, as a background for the black and white photo. Yesterday I painted the outside of my decoupage box, so now it is finished, although I will probably add another coat of medium to seal it. The image is a photo of my mom, from a snapshot that I colorized a few years ago. 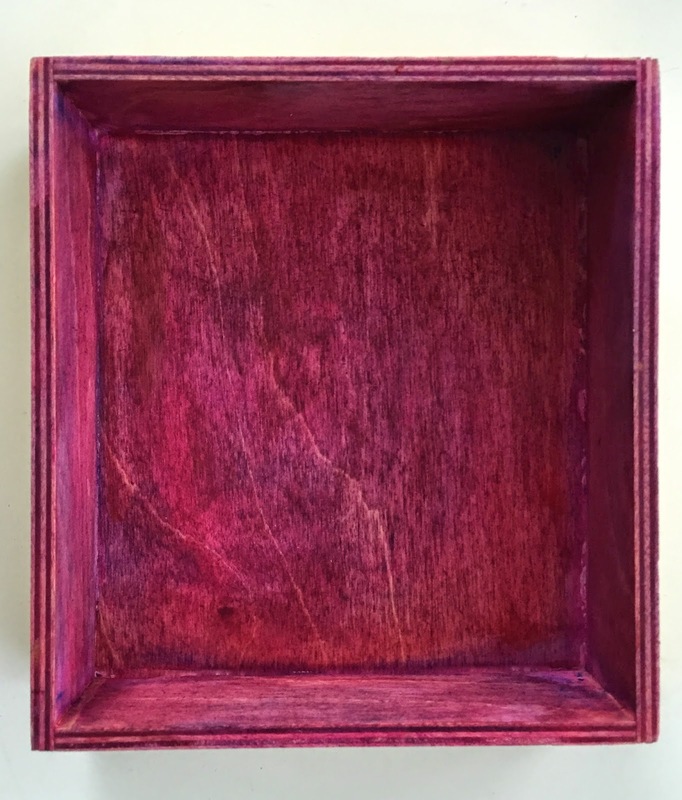 This can be hung on the wall, or placed on a bookshelf vertically, but can also be used as a little box or tray. I made this for myself, but I enjoy making these things for other people, too. 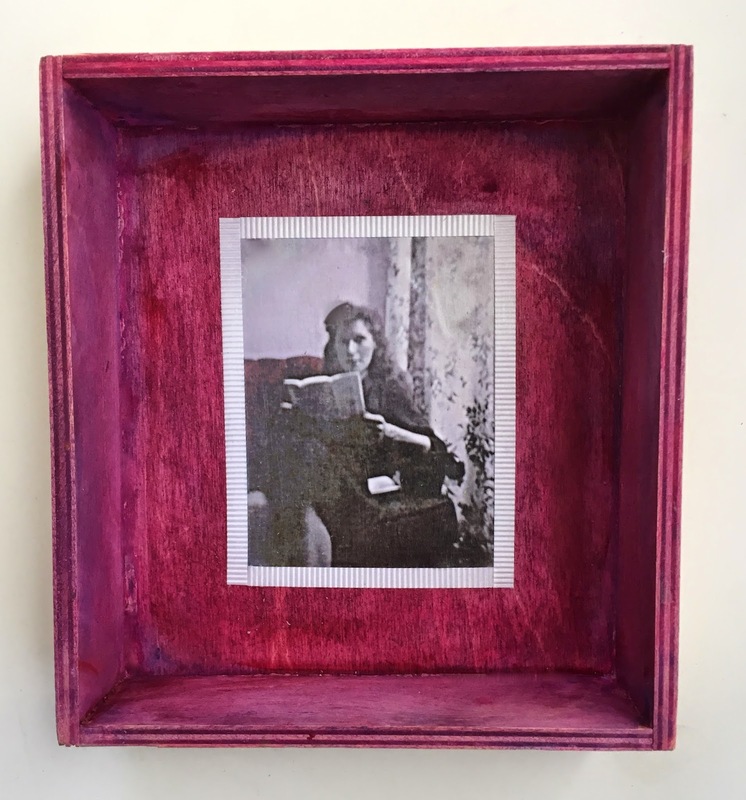 I have been working on this keepsake box, decorated with an old snapshot of my mom that I colorized using Painter. Once I had secured the photo to the inside of the box, I wanted to add a simple border. I decided to create a border with narrow gift-wrap ribbon. (When I was a small, I liked to watch my mother wrap presents for family parties, and I loved to watch her make the ribbon curl.) It was easy to make the border out of the ribbon, and it added a little bit of texture to the box. One last step: painting the outside of the box. To be continued. . . . Here is my decoupage box as it looked on April 14, 2015. The image is a picture of my mother reading a letter. This is colorized and posterized photo that I first posted here on November 2, 2012. The original version of the image was an old black and white snapshot that my aunt sent to me. I really liked the picture of my mother sitting in a chair and reading a letter. But the snapshot was only about 2" x 3" and it was out of focus and a bit scratched up. So back in 2012, I scanned it into my computer, retouched and cropped it in iPhoto and then sharpened the focus and added color overlays in Painter. This spring, when I decided to make a decoupage box, I came across the image again, and decided to use it. When I painted the inside of the box, I was trying to match the red of the chair in the colorized photo. To add this image to the box, I printed out a copy of it from the computer and used acrylic medium to glue it down. I was happy with the result, but thought it might look good with a border. To be continued. . . . This looks like a pretty minimalist post, but this is just the first step of this project. 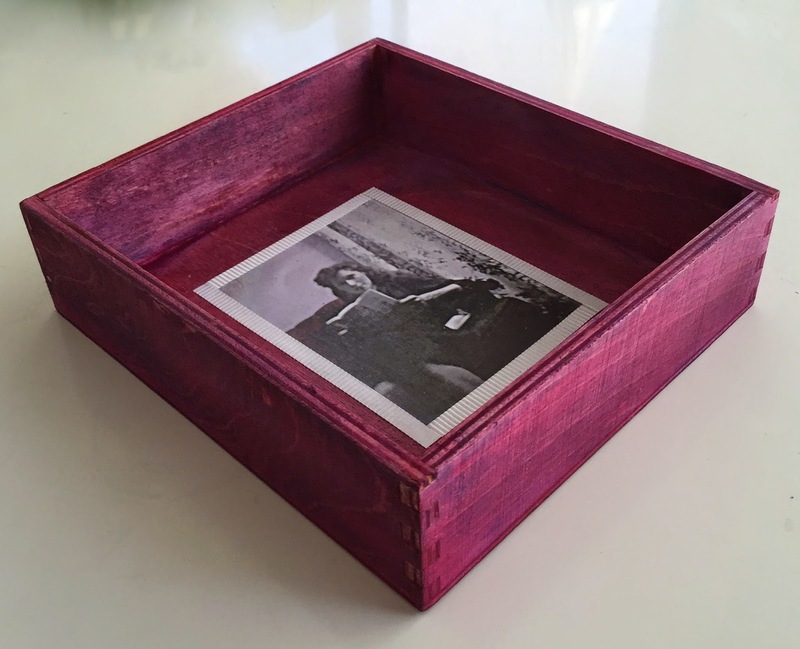 I am going to use this box for a decoupage project using a family photo. The image is going to be a rescued and colorized snapshot of my mom reading a letter, back in the 1940s. The first step was to paint the inside of the box. I am using transparent acrylic paint. To get the color I was after, I applied three layers: fuchsia, blue-violet, and red. This year I have been tutoring at a local school two mornings a week. Even though the school is just a short drive from my house, I still find it a challenge to get there on time for early morning sessions. So I usually park, lock the car, and rush straight to the classroom. 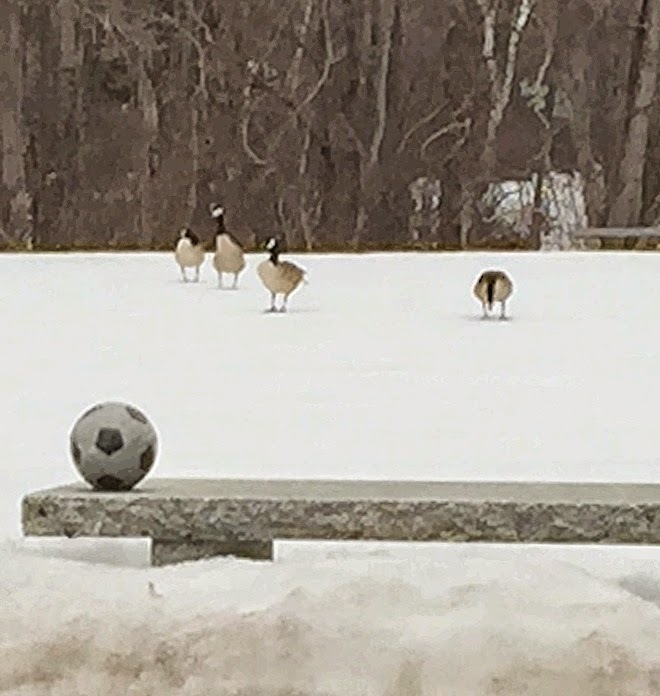 But one morning in early April, I locked the car, turned around, and saw this scene, a soccer ball framed up by four geese on the playing field. It made me smile, so I stopped in my tracks and took a quick picture with my iPhone. I tried to zoom in, but even so the geese didn't show up very well in the original photo. So tonight I cropped the image, and made some adjustments in Painter (posterizing and a bit of woodcut), and finished up with some more fine-tuning and a final crop in iPhoto. 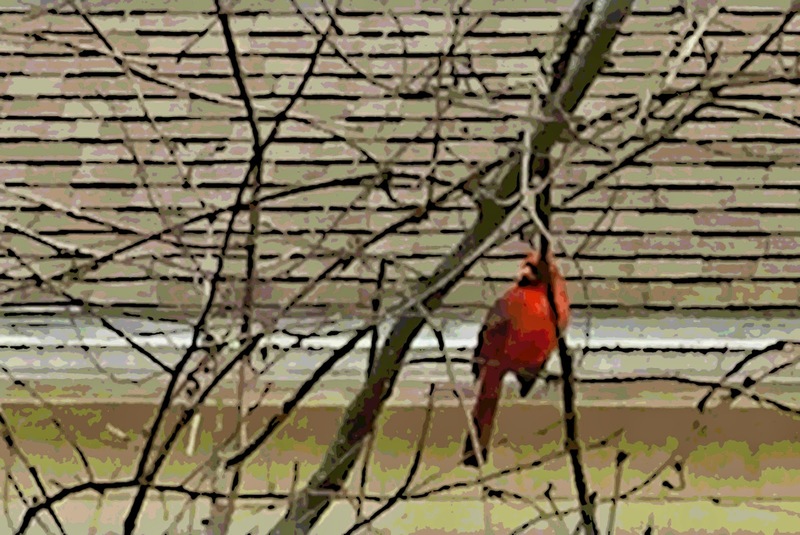 A little over a week ago (April 6), I was standing in the kitchen when I saw a bright red bird sitting in the tree outside the window. I loved the way it looked against my neighbors' yellow house. I grabbed my iPhone and took a quick picture through the blinds before the bird flew away. I didn't get a chance to zoom in or focus. So of course, when I cropped the image to emphasize the bird, the focus was too soft. So I opened the image in Painter and posterized it. Then I applied a woodcut effect to the posterized version (instead of the original) because it is possible to get brighter colors that way. This weekend, we finally had good weather for walking on the beach, so we went to Lynch Park, a waterfront park here in Beverly, MA. It was low tide, revealing sand that is usually covered by water. I liked the patterns in the sand, so I started taking pictures. I think this is the best one. 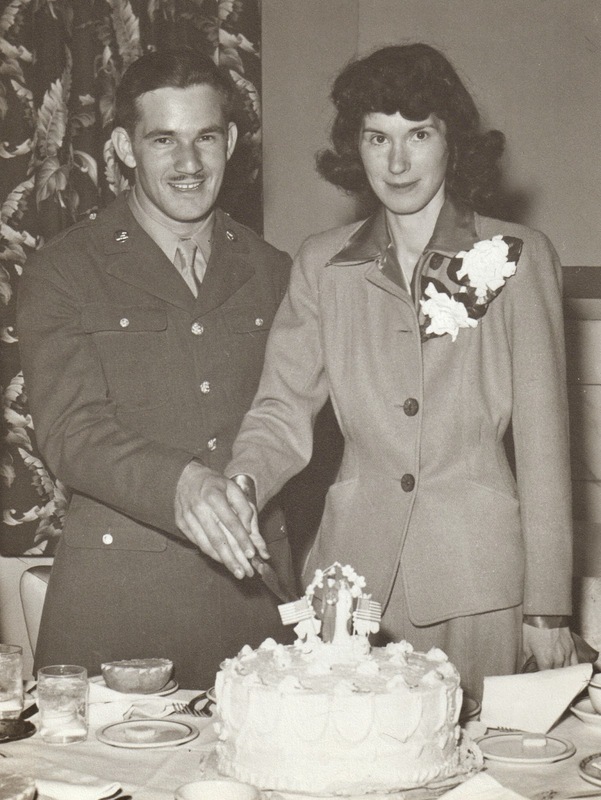 Last week I posted a black and white version of this photo of my parents at their wedding reception (April 4, 1943). My cousin David gave me an 8 x 10 version of this photo in September when I was visiting New York City. I wanted to add color, but decided to talk to my aunt first to see if she what she could tell me about my mother's outfit. My aunt confirmed that this was my mom's "going-away outfit" and that my mom had changed from the pink dress she wore to the ceremony. I learned that the suit would have been a neutral color (gray or beige) due to war time constraints. My aunt wasn't sure of the color of the blouse, but thought it was a red color. I had been thinking of going with teal blue for the blouse, but after talking to my aunt, I decided on darker pink or plum, and a gray suit with a blue cast. (Of course, when I added posterizing and woodcut effects, the colors changed anyway.) Then the problem was to integrate the color scheme with my dad's uniform. I tried to use the 1940s print of the curtains to pull some of the colors together, and to create a bit of continuity between both parts of the background. It took several tries to come up with a solution, but I am happy with this one. The color scheme reminds me of the wall paper and drapes in my childhood home. (My aunt confirmed that both the ceremony and reception took place at the Vail Hotel in Pueblo, Colorado, and there were only 40 guests.) I really enjoyed spending time thinking about my mom and dad and their wedding and talking to my Aunt Edy about it. Some of the patterns that I have made in Painter have disappeared since my last software upgrade. But as long as I still have the original image, I can recreate the pattern. 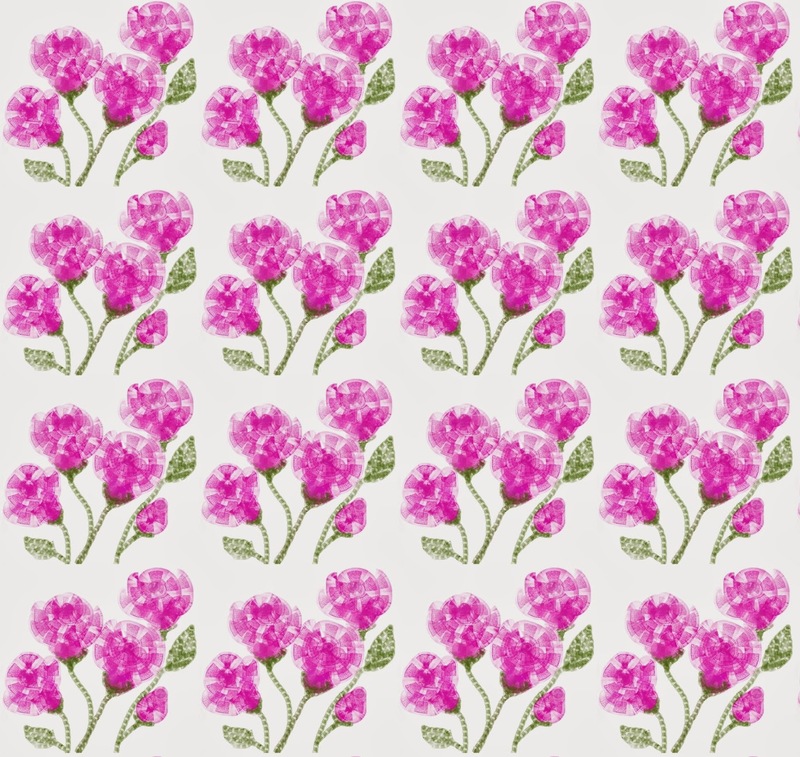 So even though I used Painter to create this pattern today, I made the pattern by "capturing" an image that I created back in April, 2011: another digital drawing of flowers. And like the other images I created this week, the drawing was made with Painter's pattern pen, loaded up with a matzah pattern. So you can see matzah in every petal, leaf, and stem. 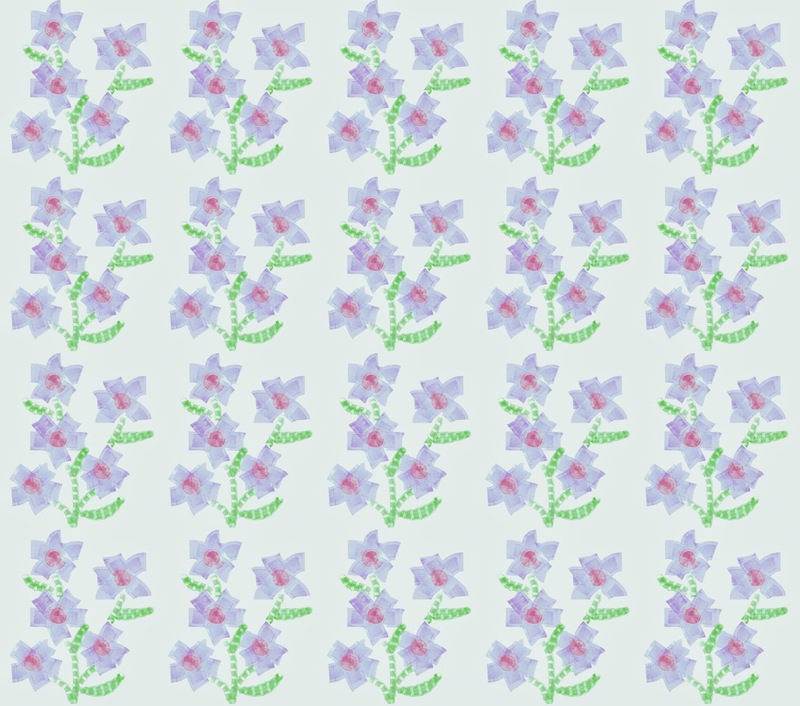 Yesterday's post was a little digital drawing of some flowers, created in my Painter program with the pattern pen, loaded up with the matzah pattern I made recently. I call these "Matzah Flowers" because every petal, stem, and leaf is made of matzah. I liked my matzah flowers well enough to use them to make another pattern as well, and so here are lots more matzah flowers, in a tiled arrangement. Here are some more matzah flowers that I made today, using Painter's "pattern pen" loaded up with the matzah pattern I made recently. (If you look closely, you can see matzah in the flower petals, centers, leaves and stems.) 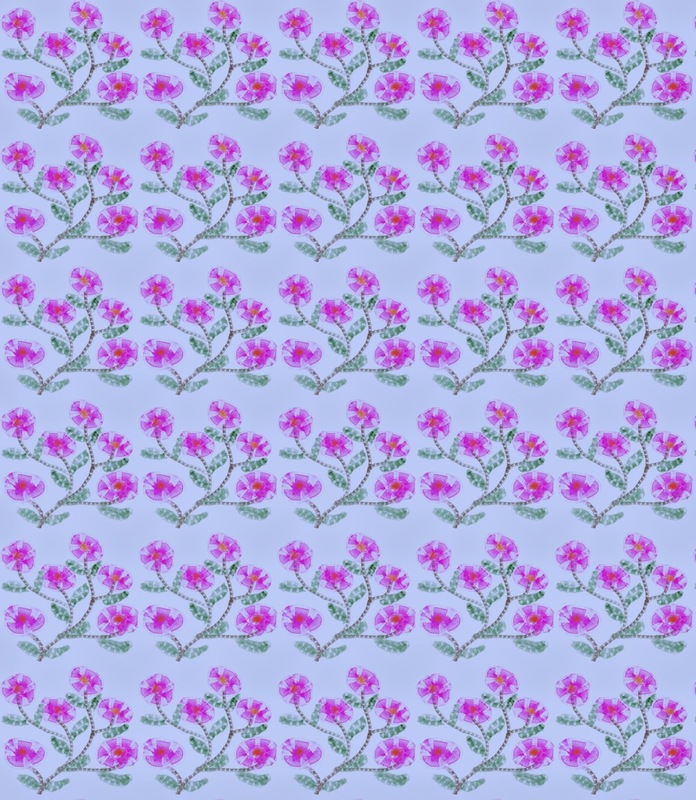 Once I had this image, I also used "capture pattern" to created a tiled pattern, which I plan to post here tomorrow. Yesterday I posted an image of roses made of matzah. 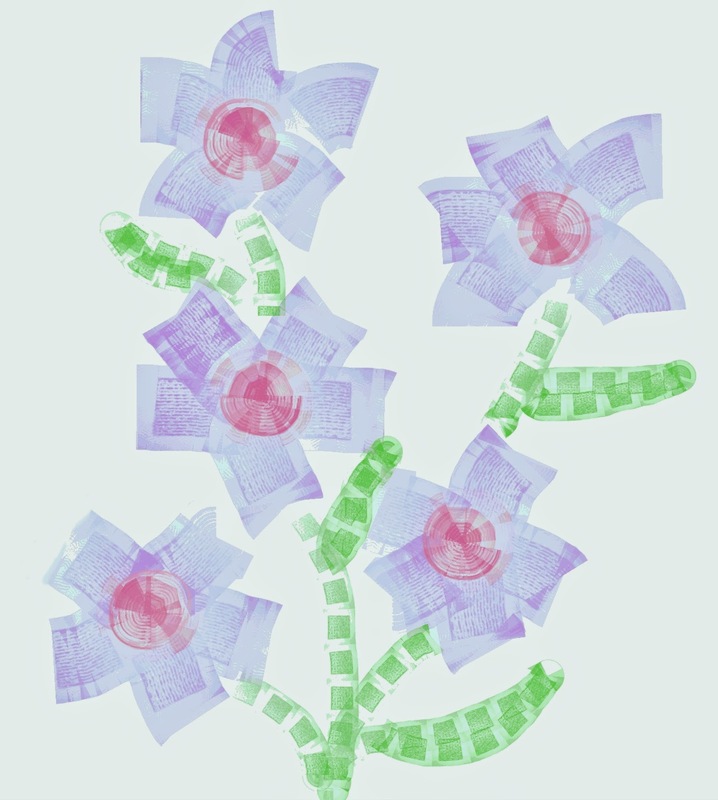 (I drew them on the computer with Painter's pattern pen, loaded up with my matzah pattern and if you look closely, you can see matzah in the flower petals and stems.) 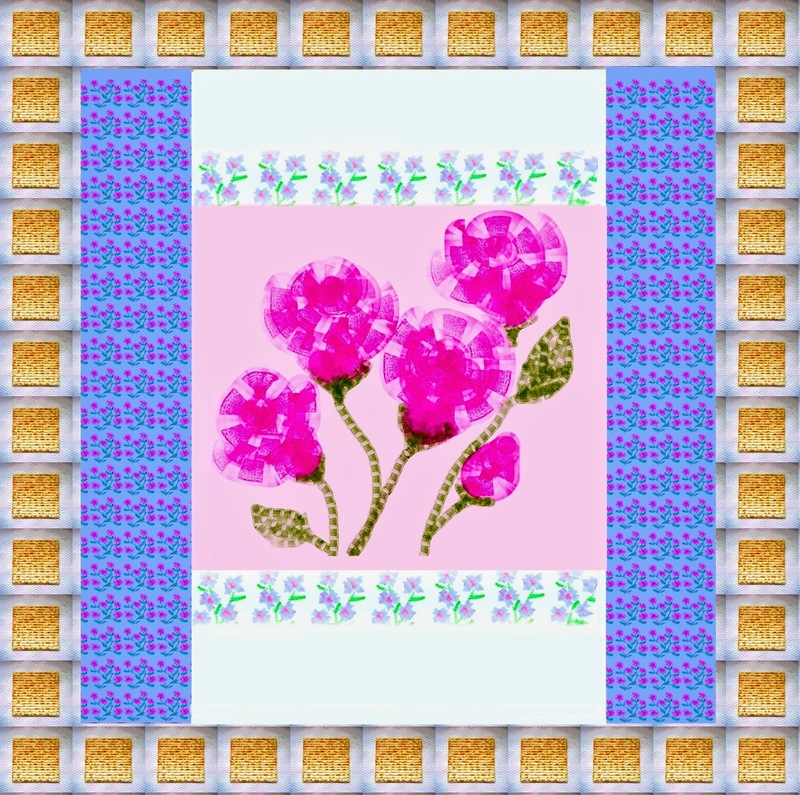 Today's post is more matzah roses, this time in a repeated tile pattern. Yesterday I posted a pattern made from my photo of a piece of matzah. The image I am posting today is a picture of four roses, but if you look closely, you will see that the roses, stems, and leaves are all made of matzah. I drew them on the computer, using Painter's pattern pen, loaded up with my new matzah pattern. Earlier this week, I posted an image of a piece of matzah with a pink border. 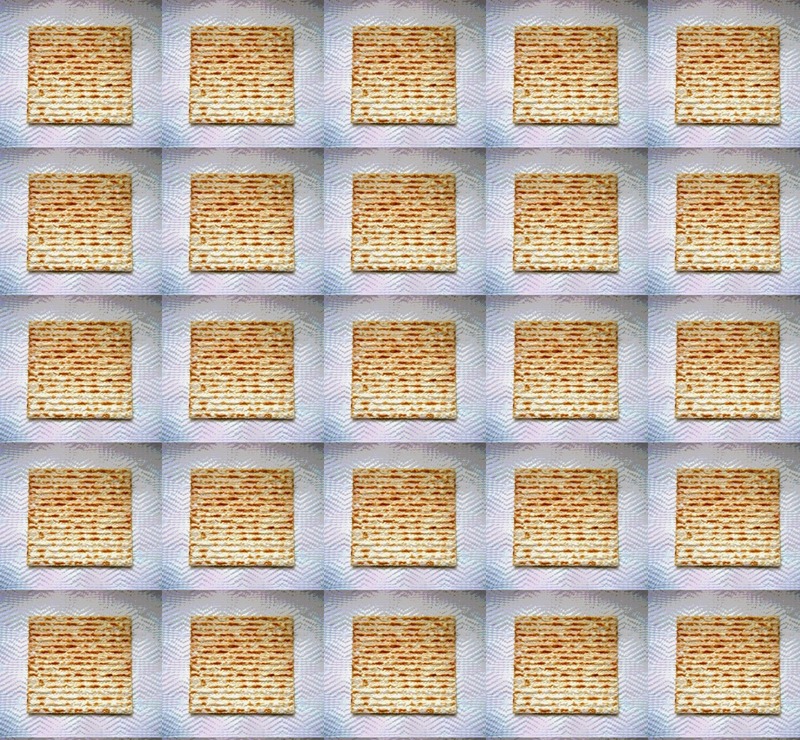 I used Painter to "capture" a pattern made of matzah, and here it is. Last September, I took a trip to New York, and my cousin David hand delivered an 8 x 10 inch photo that he had been saving for me. It was a picture of my parents cutting their wedding cake. I was so glad to have it! I had seen a much smaller version in my mother's album, but it was great to have the original version. Today I scanned the 8 x 10 photo into my computer and used iPhoto to crop out some distractions in the background (wood framing on the wall behind the bride, the edge of a wedding guest standing next to my dad). The photo was in very good shape, but I used iPhoto's retouch tool to clean up some stray marks. I am planning to create a colorized/posterized version of this, so this edited version is the first step. I did a little searching in my mom's album and realized that this is not her wedding dress, which was a pink suit with ruffles on the color and 3/4 sleeves. (All the photos I have are black and white, but in her album, my mother wrote said, "The bride wore pink".) The two gardenias she is wearing look like the same flowers that were on the bible that she carried at the wedding. So she must have changed before the reception. This looks like a "going away outfit." 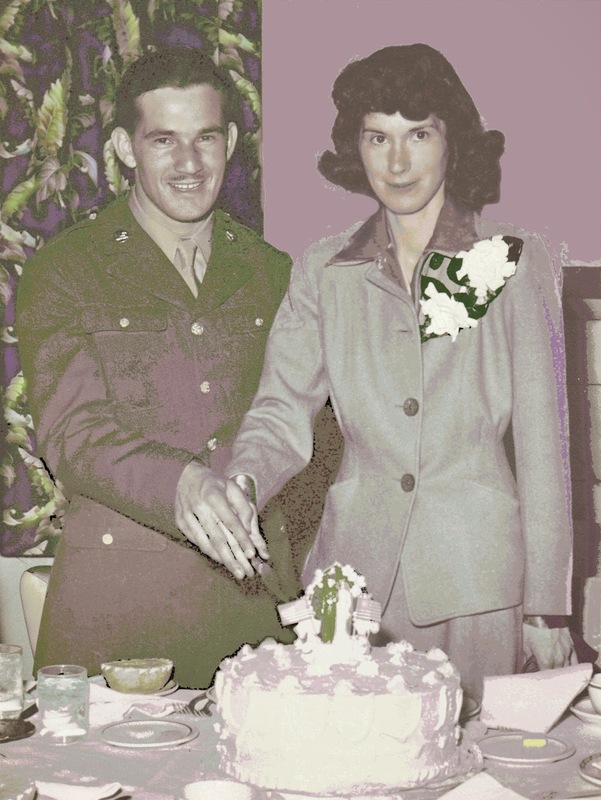 I am going to see if I can find out more about the color scheme, but meanwhile I am posting this today because my parents were married on April 3, 1943. This is a new variation of an image that I have posted here before. Several years ago, I took a photo of a piece of matzo on a paper towel, and then posterized the image to emphasize the texture. People seemed to like it. I also used that photo to make a "matzo pattern" in Painter, which I used, in turn, to make other images with the pattern pen. Yesterday, I realized that my "matzo pattern" had disappeared. (I love Painter software, but my whenever I update it, I seem to lose all the patterns I have made.) So yesterday, I decided to start again. 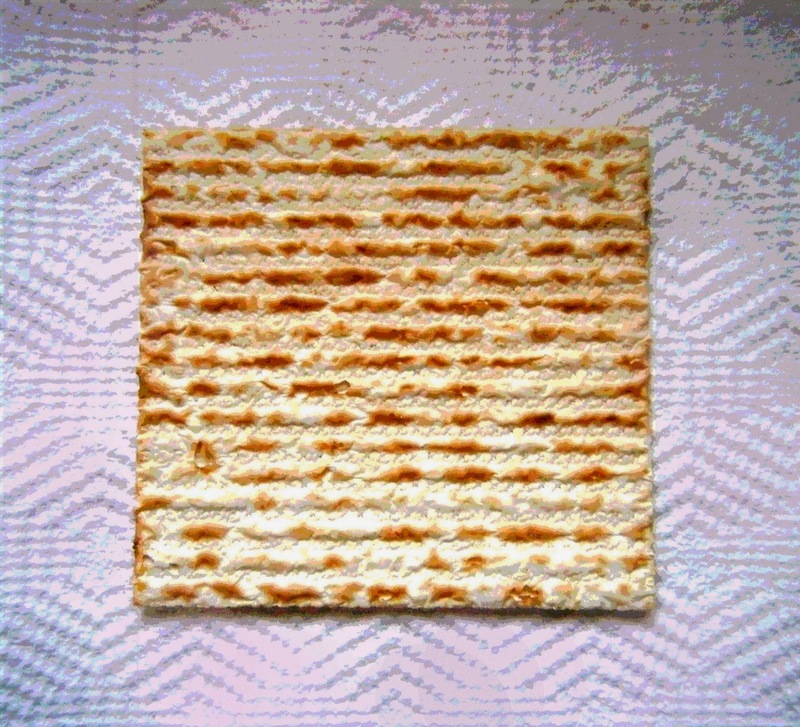 I opened my matzo photo in Painter, and this time, added pink to the border with a color overlay. 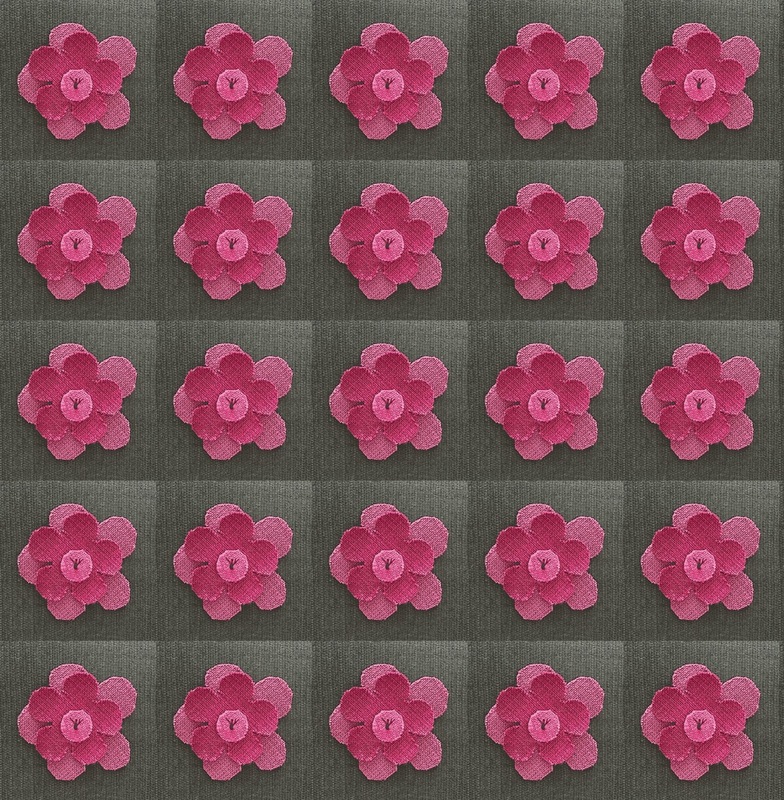 Then I created a new pattern with Painter's "capture pattern" function, and plan to use it later this week. Well, anyway, matzo is a classic, and I am going to use this image to send holiday wishes to friends and family. Here north of Boston, the weather is finally warm enough to take a walk near the water on a sunny day. But there is still snow on the ground. Yesterday I took some pictures, and tonight I edited one of the best photos to get this image. Although I took this photo on April 1, believe me, this is not a joke. Yesterday's post was an image of a little fabric flower that I had made recently at an event at the Peabody Essex Museum. 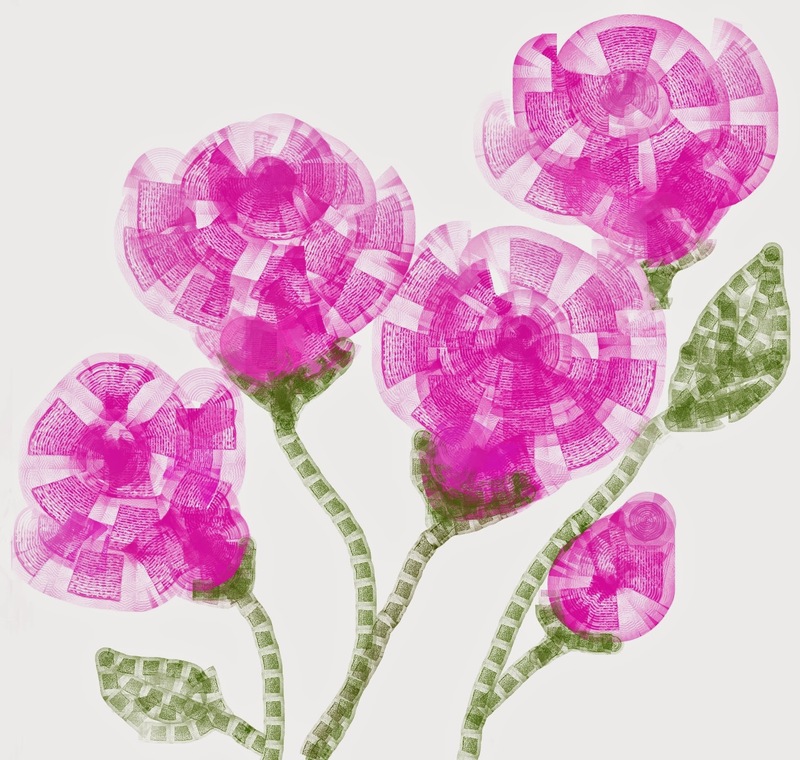 I liked the flower and thought it had potential, so I took a photo of it, and cleaned up some rough edges in Painter. Then I applied a "digital woodcut" effect. I was happy with the result and decided to use the image in a pattern. So I used Painter's "capture pattern" function. Once I had made the pattern, I used it to create this image.